Mix the meat and seasonings thoroughly by hand, cover and place in the fridge. If you are using a stock cube for your stock, dissolve it in boiling water and then make sure it is completely cold before using it. Cut the lard into small pieces, put them in a small saucepan and slowly heat until all the lard has melted. In a large heat-resistant bowl, stir the salt into the flour. Make a well in the centre and pour in half of the lard and water. Mix well, then add the remaining liquid. The dough will be very dry, so you'll probably need to tip it out onto your worktop and knead it a bit until it comes together. The dough needs to be warm when you work with it. If you find it has cooled too much and become too difficult to work, you can heat it by popping it in a bowl over some simmering water and covering it with a plate. Traditional Scotch pies would be baked without a former, but these days it's more common (and predictable!) to use a straight-sided container like a ramekin. Or you could use a circular pastry cutter. Whatever you use, it should be about 8cm (3 inches) diameter. Butter the insides of your formers, then sprinkle them with flour. Roll out about a third of the pastry very thin, and use your former to cut it into discs - these will be your lids. Make a hole in the centre of each lid - I usually use the thin end of a funnel for this. Set your lids aside, roll out the rest of the pastry, thinly, and cut it into circles or squares that will be big enough to create the shell of each pie. Gently press and stretch the dough into each tin, taking care not to make holes in it, crease it, or tear it. Use a blob of spare dough to press the pastry down into the corners. Loosely trim off any excess around the top, leaving a bit of a margin. You'll want to have your oven preheating to 140°C (284°F) if it's a fan oven, or 160°C (320°F) if not. Take your meat filling and stock out of the fridge. Divide the meat into balls and squish one ball into each pie shell, leaving a gap at the top of about 1cm (half an inch). Pour in enough stock to come up to the top of the meat. Moisten the rim of the shell with water, then press a lid in. Pinch it against the shell all the way round, and then smooth out the rim with your finges and crimp it with a fork if you wish. Paint the top and the rim with milk. The pies need to be baked for about 45 minutes, but check them after 35 and increase the heat if they look too pale. Serve hot or cold. The video above is from the Keef Cooks YouTube channel. 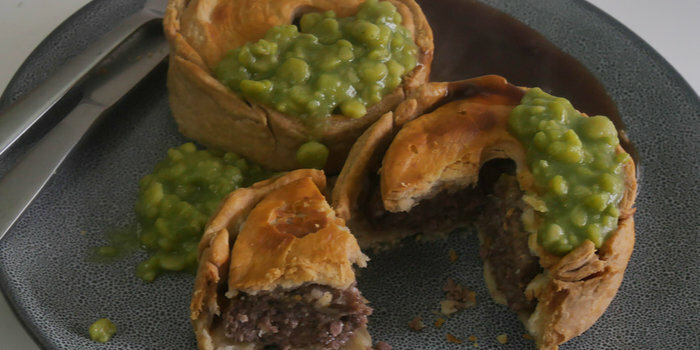 Click here to see the video recipe of Scotch Pie on YouTube.